The Malice of Fortune is, presumably, a work of creative nonfiction, a writing style that allows the writer to take factual, known events, and add plausible dialogue and action to flesh out an interesting, novelesque book. This work is so far off that mark the story comes across more as a failed history lesson. The basic plot: Pope Alexander takes the son of courtesan Damiata, refusing to return the child until Damiata learns the identity of the murderer of the Pope’s own son, the Duke of Gandia, who was Damiata’s lover and the father of her son. Damiata sets off on this journey and connects with Niccolo Machiavelli . . . yes, that Machiavelli. By the end of the first part, a compendium of characters from Leonardo da Vinci, to the military condottieri, to “ghosties and goblins and long-leggedy ghoulies” begin to surface as individuals who may hold the answer to the murder and allow Damiata to get her son home safely. But as Damiata and Niccolo visit a mysterious hut discovering an equally mysterious book of spells, a raid ensues. Damiata disappears as part one ends. Enter Niccolo to continue the saga. Brothels and witches and military conspiracies, gruesome serial murders, the horror a mother experiences when her child is taken—all of these topic-ettes should lay the groundwork for a strong and interesting story. Unfortunately, Mr. Ennis fails. There is an abundance of convenient situations that throw shades of guilt onto the military condotierri, individual members of the military, Duke Valentino, and even Damiata herself; but each ensuing situation makes the story more difficult to follow. Side trips through history—apparently designed to provide the reader with an understanding of the era—merely draw the reader away from the plot. The reader is left so confused a trip to Wikipedia to understand the house of Borgia is the result. Niccolo Machiavelli is painted as a weak character whose major accomplishment is the creation, many years after this event, of his story The Prince. It is never clear why he is even part of the story other than to introduce his later work. Damiata is designed as a character driven by her goal to get her son back—and yet the reason for the Pope choosing her to accomplish his goals is equally unclear. Although the book starts with Damiata as the protagonist, as soon as she disappears at the end of part one, so does her role as protagonist. While she does return to the story, the role of protagonist has dissipated into the mist and the reader is left with no strong main character—and a bevy of possible antagonists to choose from. 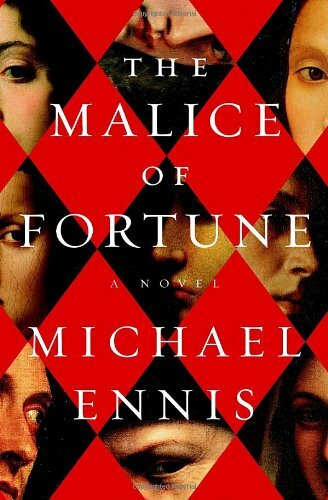 Author Michael Ennis wrote The Malice of Fortune in the first-person point of view. Mr. Ennis writes this story in four parts, with the first part recounted by Damiata, the next three by Niccolo Machiavelli. The strength of writing in the first person is that it supposedly draws the reader into the narrative character through its deep emotion and immediacy. The challenge of writing in the first person is that the reader and character are restricted to knowing events only as personal experiences of the narrator or through revelations by other characters. And therein lies the problem with The Malice of Fortune. The clarity of events as seen through the eyes of two different first-person, point-of-view characters is murky at best, at worst confusing, failing to achieve its objective. Because of the many side trips woven throughout the story and the abuse of deus ex machina, this is a difficult book to read from beginning to end. Had Mr. Ennis written it in the third person, the transition of events might have been clearer, and perhaps a more definitive protagonist would have surfaced. As it stands, those who enjoy a challenge might find The Malice of Fortune intriguing; those who prefer to be drawn into a an engaging story set in an interesting time in history should take a pass.